This time it’s a single cask Ben Nevis at 16 years old. Cost: £65 for a 70cl bottle and available here. In the picturesque Western Highlands and next to the highest mountain in the British Isles sits the Ben Nevis distillery, one of the oldest licensed distilleries in Scotland. It is rumoured to have been founded in 1825 by ‘Long John’ McDonald born 1798 in Tolgulbin, who could reportedly trace his ancient family line back to the time of Robert the Bruce. Long John was a famous figure in Whisky folklore because he was one of the first illicit distillers to sell his own Whisky and he was apparently a giant of a man in height, strength and fitness. Queen Victoria even visited Long John’s Ben Nevis distillery in 1848 where she was presented a special cask dedicated to her son, the Prince of Wales, future King Edward VII. Closed in 1986 and fortunately reopened in 1991 under the new ownership of Nikka with the quality of Whisky improving thereafter. This single malt Highland Whisky was distilled on the 3rd of December 1998 and aged in a Refill Sherry Hogshead cask, number 1407. It has been bottled at natural cask strength and there has been no colourings added – this is non-chill filtered. The aroma of banana malt loaf with sweetness and maltiness. A luscious sweet taste with a tad more fresh fruitiness. Water brings out more fruit and the vanilla cake mix flavour. A relatively new distillery to me, and I have to be honest, as yet I haven’t found a Ben Nevis I have particularly enjoyed so this one will be an interesting journey for me. Although not a new distillery to Stewart, having tried plenty of “run of the mill expressions” from this distillery, I am looking forward to seeing if this expression can excite me. Burnt toffee fights with a resin note straight away, there is a touch of sourdough, before the toffee notes really shine through. It’s powerful and has a burnt honeycomb edge, before this softens and it becomes lighter and buttery, turning more tablet like (the traditional Scottish sweet, not aspirin etc). 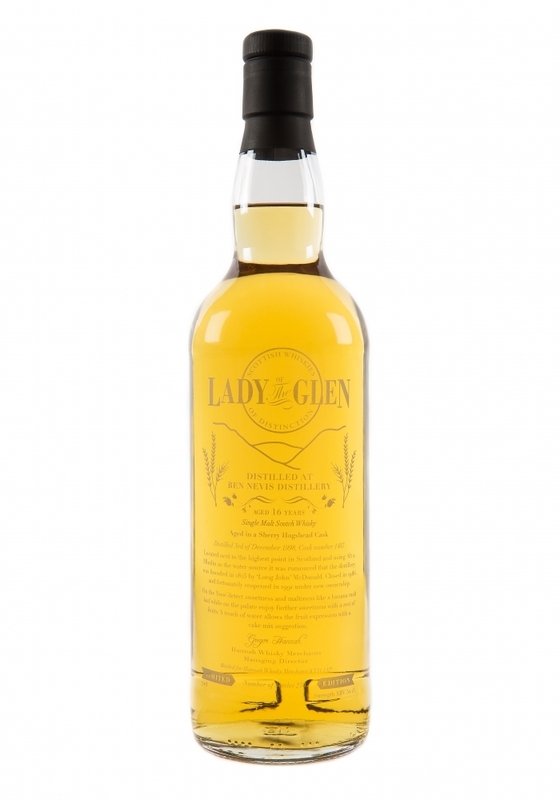 Waxed lemon peel and chocolate limes lift the dram, and it’s almost effervescent, with a slight ginger tingle, until malted milk biscuits and homemade rice pudding, with grated nutmeg put the sweetness firmly to the fore once more. The more you nose this the more you find, there are still some resin notes to be found, and the smell of fresh brown envelopes, with paper fibre and gum combining and a touch of autumn. Ok, well not what I was expecting, I thought I’d be hit with a massive dose of sweetness and that’s not the case at all. First up is a real meaty hit, steaks al la campfire, there’s a smokiness which hits the back of the palate, before the saltiness and fleshy meatiness take over. Just as you start to adjust to the savoury side, like a smallest hint of marmite on soft white buttered toast, it changes direction and takes you with it. Buttery croissants with deep plum and bramble jam waltz in, before spun sugar dances on your tongue, adding lashings of vanilla cream and soft milk chocolate and strange as it may sounds chamois leather. Before notes of an English orchard in summer, with mouth-wateringly tart green apples and soft grainy pears, there’s the smallest touch of wild strawberries, before honey and coco butter coat your tongue and leave their sweetness. Oh and did I mention the lovely drying oak note? No, well I should have, as it is wonderful, just enough bitterness to keep this from becoming cloying at times. This has a long finish, at times teeth achingly sweet, and at others, savoury, meaty and salty with a touch of damp oak and polished sideboards. Coating the mouth and bringing a stunning complexity. I’ve finally found a Ben Nevis I like, I really didn’t think it possible, but Gregor has done it again, and selected an amazing cask, with a complexity that is difficult to articulate! I can’t believe that there is so little sherry influence on this, and whilst I do like sherried whisky, this is not meant as a criticism. This whisky turns on a sixpence, you think you have it worked out and that it’s toffee sweet, buttery soft with chocolate to follow and then you hit the wonderful savoury side of things, the meat, the salt, the smoke. Then it’s all change again and the wonderful orchard notes, dark jam and rich drying oak come through and change the direction again. This is not a dram to drink without thinking, this is worthy of your time, in fact more than worthy, turn off the TV, if you must, pick up a book, but I think this is best enjoyed with another whisky aficionado where you can really discuss this and give it the time it needs. Ripe peaches mixing with fresh coffee, a big hit of earth, this is followed up by a slight hint of lemon juice before fading away and leaving autumn leaves. The coffee from the nose is their straight away but it has brought some mint leaves with it, very fresh in the mouth. Not much spice, just a small touch of heat, this soon is replaced by fresh cloves and a very oaky note. Quite warming and a medium to long finish that is also quite fresh to the mint still being present. One of the better Ben Nevis expression I have had and one that may persuade me to give this distillery a second chance. For the price point this is worth taking a gamble on if you haven’t had this distillery before or you are looking for something away from the usual suspects.